“Impressive” is the only word you can use to describe the remarkable success Clover Health Care in Auburn, Maine has had in reducing their antipsychotic drug rate. Determined to turn around their status as a “late adopter” with a 31% antipsychotic drug rate, they methodically put into place an array of effective strategies that proved to be game-changers. So effective were these efforts that they reduced their rate down to an enviable and unheard of 7.4%! How did they do it, you ask? “Focus on people and perseverance,” they said! Take a look! First, they followed a strong conviction that all discomfort and behaviors reflect a resident’s unmet need. With that in mind, they began to check and evaluate residents to confirm that no one was experiencing pain. They wanted, first and foremost, to ensure that residents were comfortable. It became key to their success. As they spoke with residents about their pain, they quickly recognized that some would greatly benefit by a simple anti-inflammatory or ibuprofen. This exercise led to a reduction in pain from 12% – 3%. In some cases, simple anti-inflammatories and ibuprofen was all that was needed to reduce resident discomfort. No powerful antipsychotic drugs needed for that! Next, they investigated which residents had been on an antipsychotic drug for a long time. Over and over they asked, “Do they still need it and if so, why? Is there something else we could be doing for them?” Recognizing that some residents had been on some of these meds for a very long time and whose conditions had changed over the years, prompted them to conduct a gradual dose reduction (GDR) on several residents. Knowing the harmful effects of antipsychotic drugs caused this team of professionals to become outspoken advocates who were passionate and well equipped to educate anyone who would listen including doctors, pharmacists, and families. They took a firm stand. They worked with discharge coordinators, pharmacist, and doctors to align their strong conviction and stand firm against using antipsychotic drugs. They educated staff and families and, even on occasion, reminded their own doctors about the need to find alternatives. They developed strategies to prevent hospitalizations. They reviewed their MDS and realized there were significant mistakes in coding which required some reeducation. One of the highlights was the program they designed to keep residents engaged and connected. They utilized a small army of well-trained activity staff (an impressive eight, in all), who engaged residents in meaningful activity including the use of Music and Memory. They served cocktails before dinner utilizing a small cocktail cart. One resident, who had been bed bound for years, found new meaning and purpose by taking on the role of local mail carrier, stopping to visit and engage other residents and staff along his “route.” He went on to become the President of the Resident Council and is instrumental in checking fire doors. Their success became so exciting that they couldn’t wait for the release of new Casper data each month. It became the favorite day of the month. It was often a cause for great celebration! Person-Centered Care is part of the ethos of Clover. There is a direct and intentional effort to develop strong and meaningful relationships with residents and families, as well as between staff members. They grow staff skills and career opportunities, which lends itself to a very impressive gallery of pictures that reflects years of longevity. It will come as no surprise that no agency staff has ever crossed their threshold due to their strong, committed workforce. 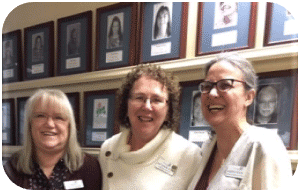 What you particularly notice when in the company of their dynamic leadership team, Patty Tisdale, RN, DON, Cindy Quinlan, RN, MSN, Administrator, and Andrea Higson, RN Asst DON, is the remarkable calm and confidence they exude. With a firm hand on the tiller, these ladies don’t spend time putting out fires or chasing after chaos, they just make steady gains improving care, quality and the lives of residents, family, and staff in a steady and determined fashion. We congratulate the Clover team for their well thought-out strategies and this impressive victory improving the lives of residents! Their five shiny stars are a tribute to our community. We invite you to share your success story with Pioneer Network. Maybe your team will be featured in a future article! Wow! There is hope! Thank you so much for your work! I’m really curious: did Clover find a reduction in the need for other medications as the anti-psychotic drugs reduced?